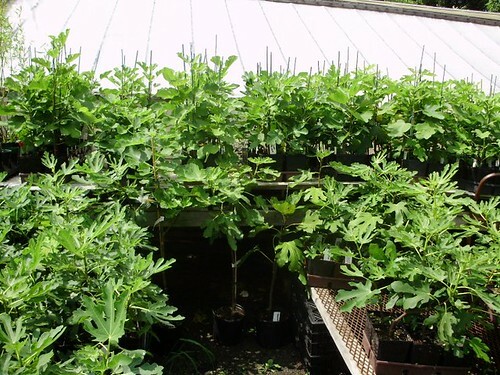 Italian and Mediterranean fig trees shipped to your door. Great gift for dad, several varieties and plant sizes available. Grown by Joe Morle with over 25 years experience as a grower. Trees can be planted outdoors* or transplanted into larger pots as they get bigger. All trees have a fully established root system and can grow up to 15ft with proper care*. Our plants are shipped potted ONLY. We do not ship to Hawaii, Alaska, and California. Order Fulfillment by City Farm Florists and Nursery, in business for over 25 years. 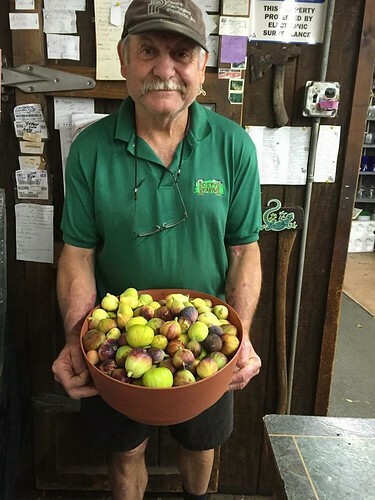 If you like fig trees, you should like us on Facebook and chat with Joe! 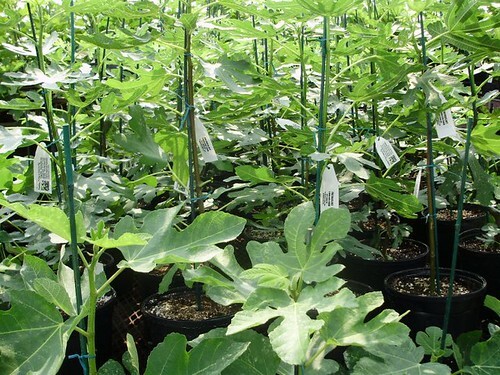 PLEASE BE PATIENT WHEN JOE RETURN YOUR CALLS AND/OR SHIPPING OUT YOUR ORDER DURING THE BUSY SPRING AND SUMMER SEASONS DUE TO HIGH DEMANDS AND OUR ACTIVIE GARDEN CENTER. WE APPRECIATE YOUR PATIENCE! THANKS! 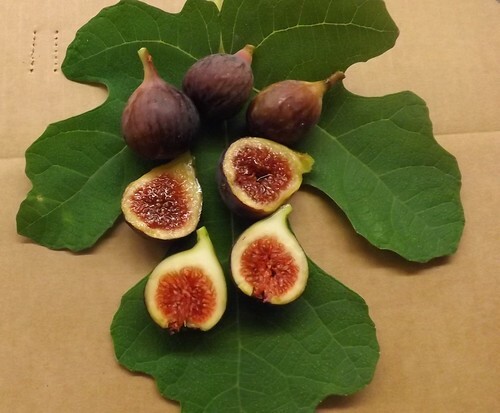 The name Paradiso Fig originated from a tale about an old man in Italy that sat under his fig tree every morning eating figs and bread for breakfast. People passing would ask him if he was alright and his reply was, "This is my Paradise (Paradiso)." 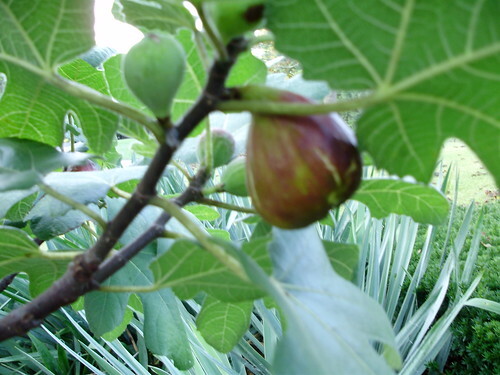 Genova Fig originates from the Northern Mediterranean, in Genova City. This plant yields an abundant amount of large fruit. The first crop is a fist size fruit, long shaped with white/golden skin and pink flesh. It is very sweet and juicy. Leaves are shaped like the palm of a hand. This plant bears two crops in August and September, Lowest zone is 5 and 6. Yields two crops per season. Very productive plant. 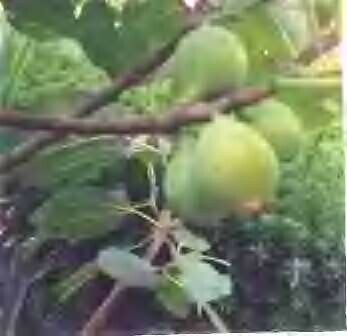 The fruit Has green/golden skin and red flesh. Delicious, juicy flavor. First crop fruit ripens mid-July in zone 5 and 6. Second crop ripens in September. The name originates from Italy in the Central Mediterranean. 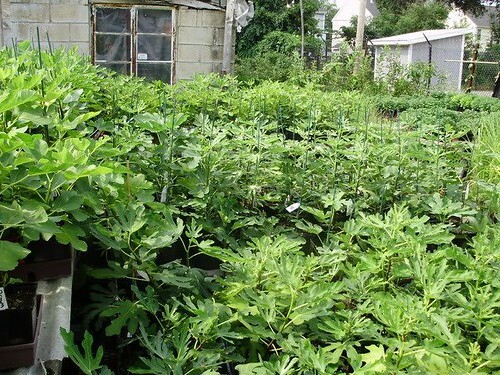 This vigorous plant grows tall and is very productive. This plant bears 2 crops. The first crop is in August and the second in September. The fruit's skin is green/golden and the flesh is white/ivory. The juicy fruit has a sweet honey flavor. The Votata name originates from the Island of Ponza, located in the Central Mediterranean. Zone 5 and 6. Plant bears 2 crops. The name was given because the first crop ripens around St. Peter's Day, June 29, in the Central and Southern Mediterranean. 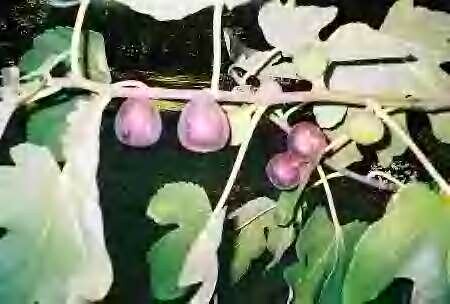 The fruit is large and long shaped with a dark mahogany skin and red flesh. It is very delicious with a sweet and juicy flavor. The second crop ripens in mid-September. The zones are 6 and up. Old variety. Brown skin, red flesh fruit. Medium-size, long-shape. 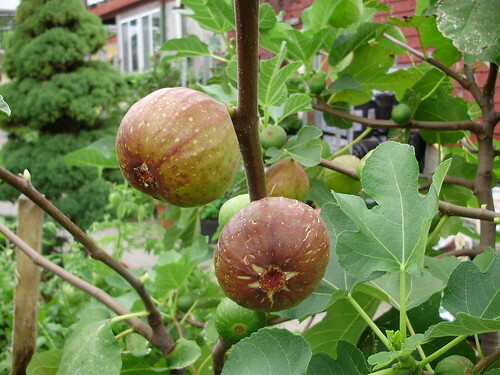 Most hardy plants in the fig family. Very productive. Zoning 5 and up. The name was originated by the color of it's skin, yellow-golden. Strawberry colored flesh, very sweet, and productive early. Early variety. First crop ripes in July and second crop in September. Zoning 6 and up. Round fruit, medium size. Very juicy and sweet flavor. Dark skinned and pink flesh. Two crops per year, Zones are 6 and up. The Black Mission is an old variety that originated in Spain and brought to the U.S. 3 centuries ago by a Fransican missionary priest to San Diego, California. It has a black skin with a light, raspberry pulp. It bears two crops. The main crop is medium size with an excellent flavor. 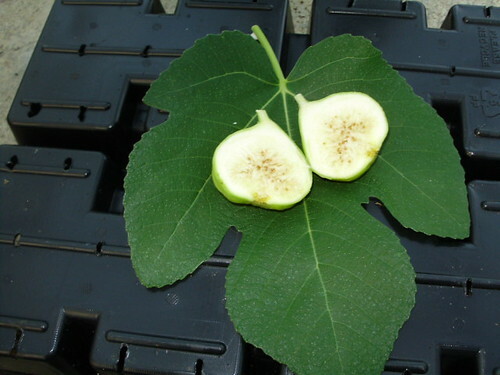 One of the most popular figs in the commercial market. Can be grown in the ground and containers. Zone 7 and up. One of the most productive varieties bearing sweet fruit that has a dark skin and pink flesh. A medium sized fruit with a long neck. Does well in the ground or container. Can be eaten fresh, dried, or in gourmet recipies. Zone 6+. Mosly well known from Sicily to Agro Pontino "Sociaria" as Figo Bianco, is an excellent variety. 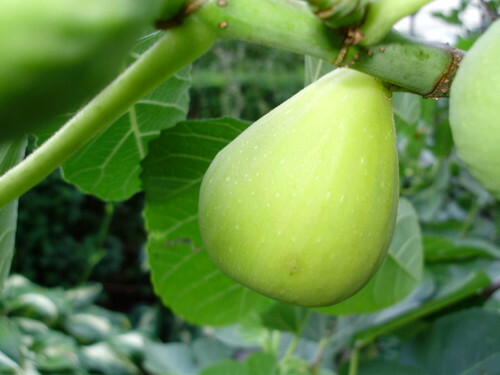 The Italian Honey Fig is a good size fruit with a greenish to golden skin and an ivory to cream colored flesh that contains the sweet flavor. Does well in the ground or container and yields two crops a year. Zone 6+. 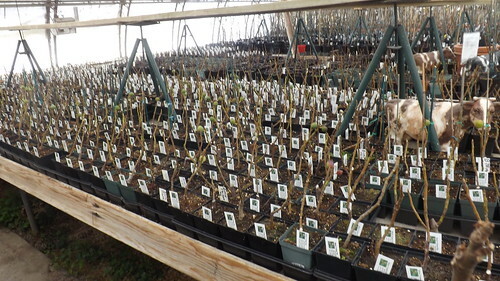 Dormancy is a natural behavior for fig trees. 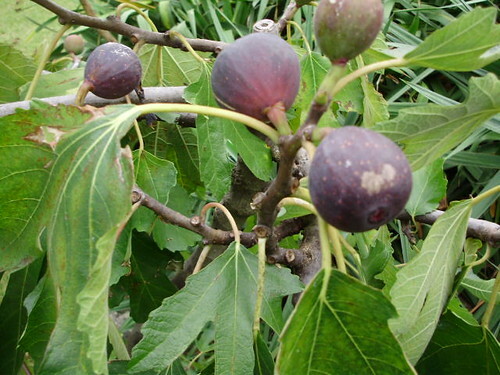 Fig trees usually start their dormant period late fall and they revive themselves early to mid-spring. 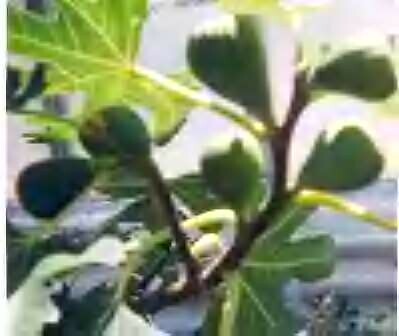 I would like to share my 25 years of experience on how to grow fig trees in containers. 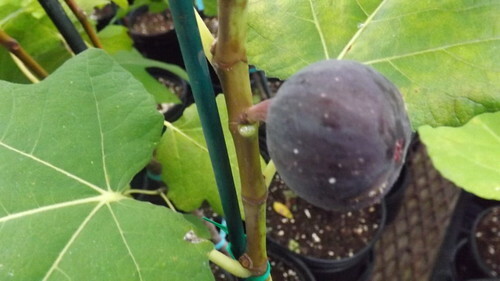 Container grown fig trees yield as much fruit as those planted in the ground, but they require different care. They need more fertilizer, lime, and water. The best fertilizer to use is one that is lower in nitrogen, but heavy on the calcium and phosphorous. 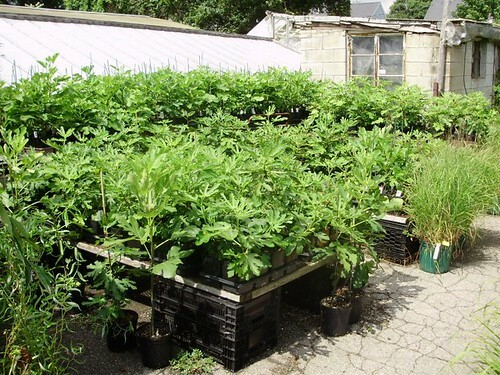 The first feeding is done in the Spring, as soon as you move your plants from their shelter to the outdoors in a sunny location. The fertilizer consists of, 1 part superphosphate 0-20-0, 1 part 5-10-5, 1 part bone meal, and 1 part garden lime. Mix these ingredients thoroughly. Apply the fertilizer by making 4 holes at the edge of the pots, 1" in diameter and 3" deep. Fill the holes with the mixture and water thoroughly. 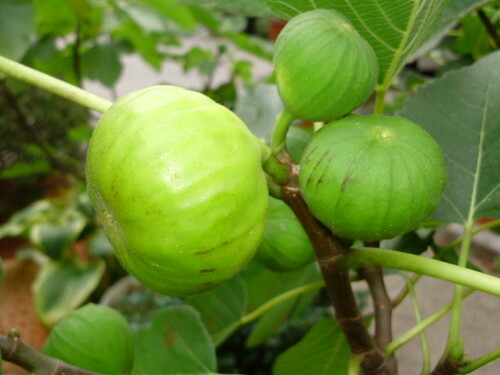 A fig tree, three quarter inch caliber and 4' tall in a 12" pot requires 1 cup of this mixture. One month later you will begin a liquid feeding with a well balanced fertilizer, 20-20-20. Mix 1 tablespoon with 1 gallon of water, repeat this feeding every 20 days until mid-August. The last feeding will be a top-dressing done in October. Mix 1 part superphosphate, 1 part bonemeal, and 1 part garden lime. Make sure that during the summer months you water your trees frequently. Keep them moist and do not let them dry out or stressed. This is why they may lose their fruit. 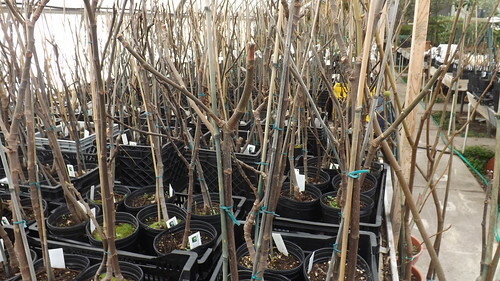 By the end of August you will start cutting back on the water, this prevents the fruit from splitting. You should change the pot every year, going only 2 sizes up each year, until you reach a 24" to 30" diameter pot. 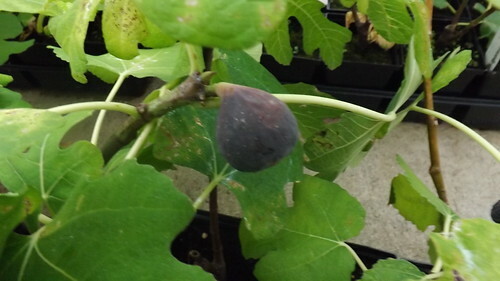 At this point every 4 years you must root prune your fig tree. Take the tree out of the pot and cut one-quarter of the roots away, making a root ball. Replant the tree in the same pot with 3 parts potting mix and 1 part organic compost. This must be done while the plant is dormant, either in the early Spring or late Fall. If you have any questions, feel free to give me a call. I will be happy to answer all your questions. 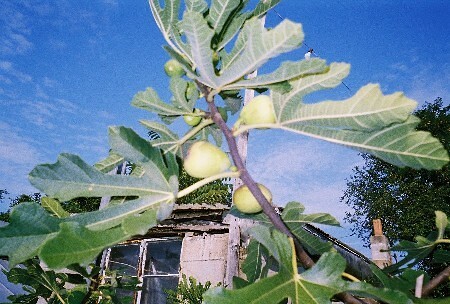 Enjoy your fig trees! A mix of delicious ripe figs.